Community nurses in Scotland now have the opportunity to go on a nine-month development programme to earn the right to be called a Queen’s Nurse. These expert community practitioners will be catalysts for change, says Clare Cable, chief executive of the Queen’s Nursing Institute Scotland. Scotland's 20 new Queen's Nurses outside the Scottish Parliament. The Queen’s Nursing Institute was established in 1887 – Queen Victoria’s Golden Jubilee – to train nurses to provide home nursing for the ‘sick poor’. Queen’s Nurses were trained until 1969, when a National Certificate for District Nurses replaced their training. The prestigious title Queen’s Nurse was reintroduced by the institute in 2007 to promote the highest standards of patient care in the community. There are now more than 1,100 Queen’s Nurses in England, Wales and Northern Ireland. Queen’s Nursing Institute Scotland (QNIS), a separate organisation since 1915, offered a different range of development opportunities. But by 2014, as the reputation of Queen’s Nurses grew, community nurses in Scotland were asking the QNIS for the opportunity to be awarded the title. In 2015 we began an extensive consultation on what a new Queen’s Nurse might look like in Scotland and what support and preparation they would need. Queen's Nurse Ian Hall on the Orkney island of Shapinsay (see box). Our Queen’s Nurse programme has two objectives: to develop practitioners to enable them to be the best they can be, and to tell the story of the extraordinary everyday things that nurses do in the communities of Scotland to inspire others. We hosted a summit in January 2016, bringing together experts from across professions to share learning on developing excellence. Leaders were invited from primary education, the prison service, medicine, allied health professions, social work and nursing. A task and finish group was convened of QNIS trustees, executive nurse directors, leaders from higher education, research and the third sector. After much discussion, what emerged was an ‘excellence profile’. They find opportunities – or circumstances find them – for changing how things are currently done, recognising how things should and could be, making things better for individuals, families and communities and/or helping others to make a significant impact. They find their way across boundaries, around obstacles, through bureaucracy and successfully challenge ‘but we don’t have control over that’ or ‘that will never work here’ attitudes. They keep bouncing back, finding new doors to open each time one closes. Through ‘coming from the heart’, their enthusiasm and persuasive nature, they create a groundswell of support and recognition, getting others to commit and get things done. They listen deeply, seeking to understand what really matters. They approach life reflectively, always learning, and are kind to themselves. They will sometimes be surprised by personal recognition for their achievements, and are quick to attribute success to the contributions of others. The task and finish group then took up the challenge of creating a programme that would enable participants to develop qualities set out in the profile. The result is the nine-month Journey of Discovery – a carefully crafted programme including residential workshops, and the opportunity for reflection and personal growth, enhanced by telephone coaching, follow-up workshops and an active community of support between participants. It is based on the framework for person-centred practice described by Brendan McCormack and Tanya McCance in their book Person-Centred Practice in Nursing and Health Care: Theory and Practice. During the programme each participant works on an issue as a focus for improvement and reports back on the impact of the journey on them as an individual, their team and their practice. QNIS has committed to enabling 20 expert community practitioners to undertake the programme and be awarded the Queen’s Nurse title every year. Our new Queen’s Nurses are nominated by their employers – health boards across Scotland – as well as independent and third-sector organisations. After written applications and selection events in January this year, 20 clinical leaders were chosen for the programme. They represent the geography of Scotland from the remote islands to the big city centres, the borders and the rural south west. Roles are diverse: working with children and families including refugees and asylum seekers, adults and older adults, those who are homeless or within the criminal justice system, and in mental and physical health, including end of life care. A number of our Queen's Nurses are advanced nurse practitioners and some have specialist roles. A great deal of thoughtful planning went into the Journey of Discovery, but the extraordinary alchemy created by the combination of the person-centred framework, the structure of the programme, environments, facilitators (Jane Cantrell, Brendan McCormack and myself), coaches, and participants has been transformational for everyone involved. Ian Hall is drawn to extreme remote and rural nursing practice. His last big job saw him help establish the first healthcare and community development project for nomadic Tuareg people, in the north Niger desert. 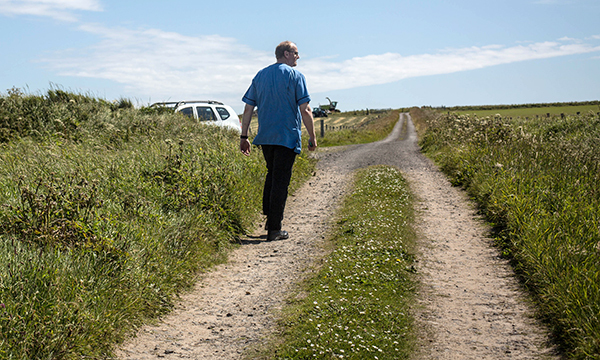 These days he looks after people living on the Orkney island of Shapinsay. 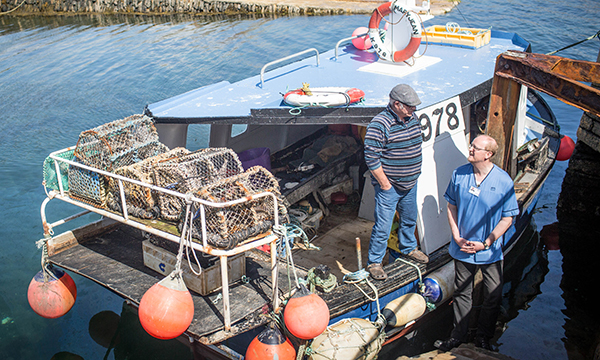 Ian Hall has trained people on Shapinsay in first aid and as second responders. 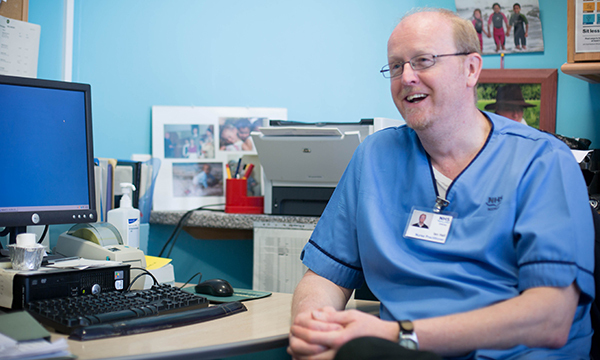 An advanced nurse practitioner, able to turn his hand to emergencies, diagnosis, prescribing and treating, Ian is Shapinsay’s resident health professional. Responsible for overseeing the health of the island’s 300 residents, he knows his neighbours well. Ian and his wife Jenny bought a working croft when he got the post on Shapinsay in December 2012, and they live there with their four children. Not seeing enough cases to maintain proficiency across the clinical spectrum is a risk for practitioners in remote and rural areas. To address this, he has started working with nurses on the other islands – ten in total – to establish a clinical supervision network they can all use to maintain their knowledge and skills as expert generalists. The first new Queen’s Nurses in Scotland will receive their awards during a ceremony on 1 December in Edinburgh, and will receive certificates signed by the Queen, our patron. A new Queen’s Nurse badge is being made by an Orkney-based firm and there is also a Queen’s Nurse Harris Tweed tartan. Our vision is to create a social movement of Queen’s Nurses who are catalysts for change in their communities, working with the people of Scotland to encourage health and well-being. It is the beginning of a shared journey, which we hope will continue for years to come.